It's unlikely that you try every Mac video encoder by yourself since there are a wide selection of video encoder programs out there for Mac. The much more reliable solution is to select one from the below top 5 video transcoders to do your video conversion task. What sets them out of the crowd is that they not only help you encode any video on macOS, but also accomplish the job at No.1 fast speed. You're not buying this? Give them a Whirl! Technology's go ahead on in leaps and bounds since the early days and this is epitomized by the proliferation of portable devices nowadays. At some stage you've probably all needed to transform videos between various formats. Whether it's to make that YouTube video offline watch on your iPhone/iPad, or to make MKV video content compatible with a different player than the one they were originally meant for. This is where video encoder for Mac comes in. There are number of handy video encoding applications out there for this very purpose. This roundup covers top video encoder apps on Mac OS X, helping you quickly find the No.1 video encoding and compressing on Mac. The best free Mac video encoder here comes MacX Video Converter Free. It supports all kinds of video conversion, video compression and editing on macOS (macOS Mojave incl. ), namely decoding and encoding videos to H.265, H.264, MPEG4 or whatever codecs for WMP, QT, or iPhone Xs/Max/XR/X/8/7, iPad, Apple TV, Android and more. Besides, with multi-core CPU and hyper-threading tech, the free video converter for Mac delivers unmatchable converting speed (up to 15X faster) and unparalleled quality for the converted videos. Step 1: Free download the video encoder for Mac and launch it. Then load video files by clicking "+" button. Step 2: Choose output format you wanna decode to. You are suggested to free convert video to MP4 for its wide compatibility with Quicktime, iPhone iPad Android. Step 3: Hit "RUN" button to start transcoding video to MP4, MOV, AVI or any other video formats. Note: If you desire to free download and convert videos from YouTube, Facebook, Dailymotion, Viemo, Vevo, Instagram, IMDB, XNXX, etc., please resort to its advanced version MacX Video Converter Pro for help, which will provide you with much more surprises. 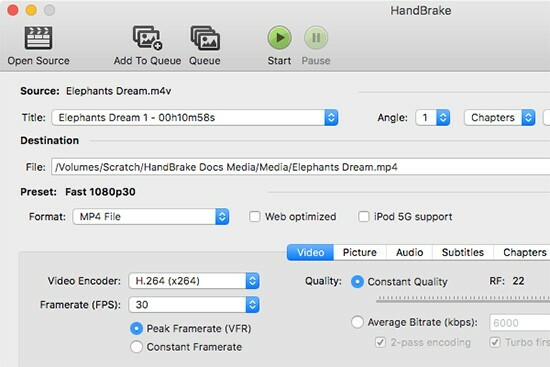 Handbrake is one of the most popular DVD-ripping video transcoders, as well as a trustworthy video encoder for Mac users. Handbrake incorporates a wide selection of choices for exportation your video out for several totally different devices. These vary from Apple TVs to PSPs, creating it quick and simple to convert nearly any form of format so it'll play on your iPhone for instance. Handbrake isn't the most intuitive application ever made. Few people will be able to just jump right in and start using it when they initially install this Mac video encoder. Due to it's open source nature, the application isn't updated often, it doesn't have an enormous vary of outgoing formats to decide on from if you're looking for something obscure. Don't be confused by its name. MPEG Streamclip, the new-rising star in video encoder for Mac community, is not just for MPEG video, but also has highly flexible encoding ability that can transcode videos into many broadcast standards. 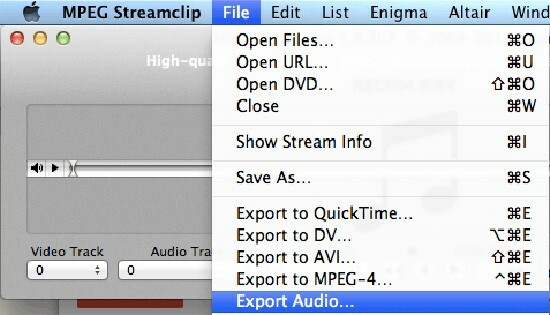 With MPEG Streamclip, you can convert QuickTime movies, MPEG-1/2/4 files and transport streams into AVI, DV and MPEG-4. MPEG Streamclip can also download videos from YouTube or Google, simply by entering the URL into the application. However, the free video encoder - MPEG Streamclip looks a little complicated to the uninitiated. The conversions made with MPEG Streamclip was quite blocky when having to render large sections of the same or similar color. FFmpegx is fast video and audio encoder, as well as free video converter Mac . It doesn't support previewing video as HandBrake and MPEG Streamclip do, but Supports subtitles in most formats. It is a little complex for beginners, as it is filled with settings and tools, that only confirmed users will feel comfortable with. It is more suitable for experts who want to set some advanced preferences. All in all, though much complicated, FFmpegx is a complete, cross-platform solution to record, convert and stream audio and video. Miro Video Converter is a free mac video encoder and converter, it has pretty intuitive interface, you can easily know how to handle it as soon as launch the app. It's a basic freeware option that works well for a variety of formats and devices, such as MP4, H.264, MPEG4, AVI, FLV, iPhone 7/7 Plus, iPad Pro, Samsung, HTC etc. Just drag videos to it or choose files on your Mac. It can convert videos to popular Apple devices (iPod, iPhone, iPad, Apple TV), and Android Phones, and other media players. But it also has its cons, namely it owns too few output profiles, and no batch conversion, but it is good for beginners. After giving all of free video encoder apps a go, these tools all help you convert your video from various of videos to the one you allocated. Among that abundance of software is a collection of free Mac video encoders which can cover nearly any situation you could find yourself in. Yet for all that, if you're looking to versatile free video encoder for Mac that way not only transcode video, but download video from YouTube, turn photo into video slideshow, record on-screen activity for creating game tutorial, even remove iTunes video protection, MacX Video Converter Pro can tackle nearly all video encoding tasks and does all of the bells and whistles in auxiliary functions. Encode any video to MP4, MOV, HEVC, H264 with 420+ profiles.